Do you know how to pull off the most gorgeous outfit you’ll ever wear? Styling your bridal ensemble is a balancing act. Too much bling, and you’ll look like a kid playing dress-up. Not enough, you might appear bland and boring. Wedding jewelry should complement—not overshadow or clash with—your belle robe. Common gown necklines include off-the-shoulder, one shoulder, high neckline, bib neck, straight, scoop, sweetheart, illusion, v-neck, strapless, and backless. Scroll to find your dress, or discover your best styling options for each type! Gowns that lay off the shoulder are usually romantic, destination, or bohemian in nature. As such, minimal jewelry is usually the best way to go. The look here is meant to be soft and sensual. Pair this neckline with a dainty round necklace (if at all) and compensate with small drop earrings. A bracelet is a lovely finishing touch. You can even add a belt to give your dress a bit more interest. Common mistake: Wearing a 3+ piece jewelry set. Don’t be too matchy-matchy. Trendy tip: If you love bling, go the other way: wear a bib necklace and rock that sparkle. One-shoulder gowns are formal and reminiscent of beauty queens—the focus is on your beautiful face and that little bit of skin you’re showing. This is a popular style for destination and/or black-tie weddings. Pair this neckline with dramatic, extra-sparkly earrings. A bracelet rounds this outfit off nicely. If you want more bling on your dress, you can add an elegant pin. Maximum on this is two or maybe three items. Common mistake: Wearing a necklace. You don’t want to cover the fabric with anything. 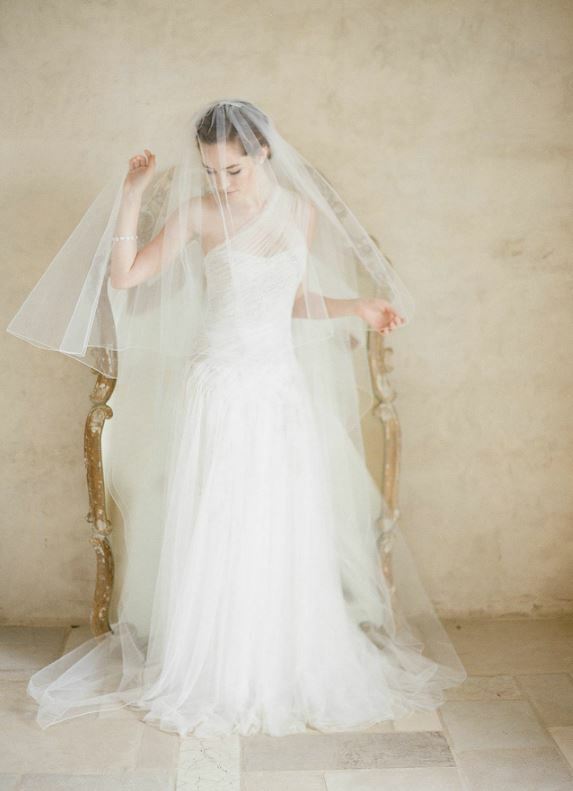 Trendy tip: Pair a veil with your look to make it more classically bridal. 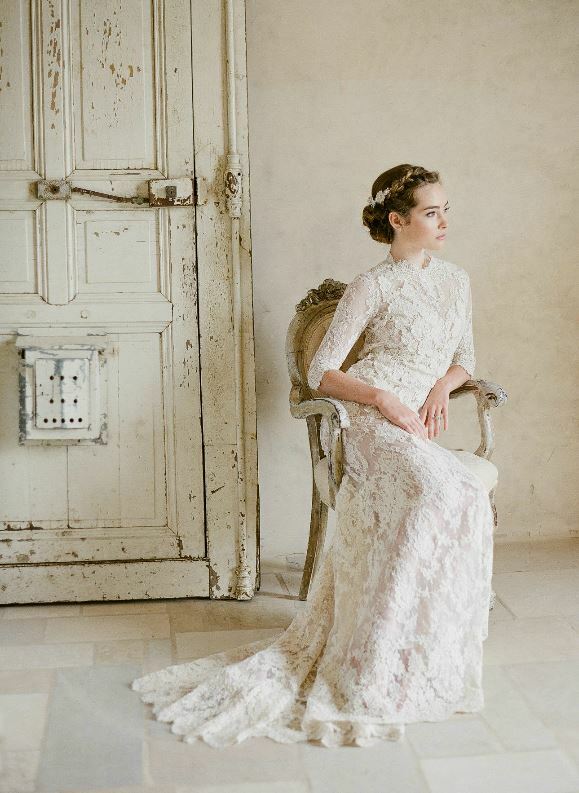 A gown with a high neckline is often vintage-inspired and/or features lots of lace. A bib neck is similar to the mock turtleneck in that it comes up high, but it forms a triangle shape that is less formal. Minimal stud earrings are the best option, so there’s no distraction from the beautiful detail of your gown. A pretty headpiece or comb is better than jewelry in this case. You don’t need a lot of bling for a sweet, romantic ensemble. Add a bracelet or ring to round off the look. Common mistake: Wearing a necklace, which tends to look overstyled and/or too casual. Trendy tip: Style a pretty updo and play around with those lovely locks. Add a clip or comb! A straight neckline is usually a strapless gown (though it can have spaghetti straps) with a distinctly ‘90s feeling to it. Many of these dresses tend to be satin, but some feature lovely lace or even organza. To avoid looking too severe, pair this neckline with a round necklace or bib that adds some flair to your outfit. Definitely play up your earrings and create an ultra-romantic hairstyle. You can add a bracelet or a belt. In this situation, more is more. Common mistake: Not enough bling. Don’t look too bare in your photos. Trendy tip: Cover up your shoulders when it gets cold with a wrap or bolero. This doesn’t interfere with your jewelry and adds some intrigue. Scoop necks give your silhouette a fresh, almost casual look. For this reason, you don’t want a lot of bling around your neck. If your gown has a very low scoop neckline, a choker or minimal charm necklace is a sweet addition. Otherwise, leave it off and choose earrings that go with your theme: minimal for a laid-back outfit, and more sparkly for a formal gown. If you’re wearing a bohemian gown, incorporate natural stone jewelry. If your style is classic, wear pearls. Common mistake: Wearing a round necklace. This retro style mirrors the dress too much. Trendy tip: Definitely show off a bracelet, or even stack a few! 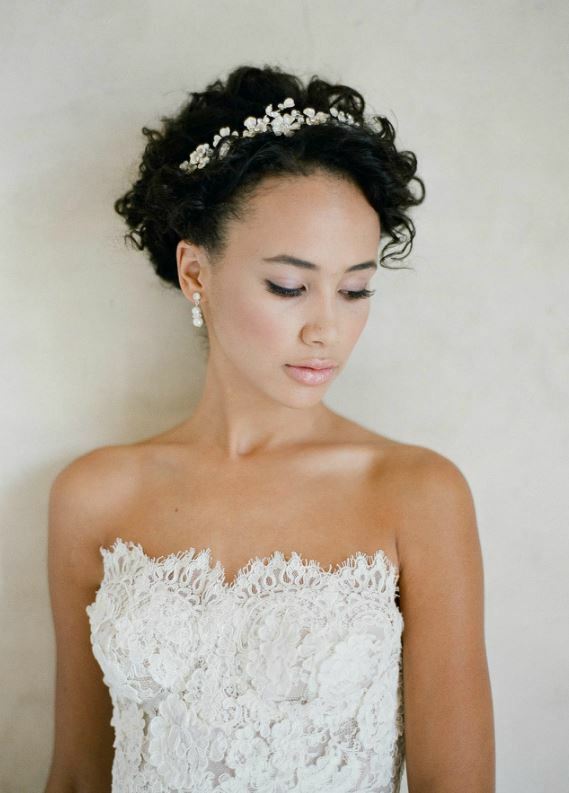 This lovely neckline is probably the most recognizable in the wedding industry. It even sounds romantic. A sweetheart gown is usually a strapless ball gown or an A-line dress. It is formal and sometimes over-the-top elegant, with a feminine vibe that is irresistibly bridal. This neckline pairs well with just about anything: a bib necklace, a round necklace, or even a dainty drop necklace. Polish off your look with earrings that match. If you’re wearing a belt, be sure that the bling isn’t overwhelming. Common mistake: Overdressing. Try everything on together and make sure you don’t look like a doll. Trendy tip: Pick your favorite piece of jewelry as the focal point. Everything else should be smaller and/or complement that item. An illusion neckline is a layer of sheer fabric that comes up after the main portion of the gown ends. Gowns featuring illusion are usually breezy, lacking structure and instead bringing lots of dreamy layers and romantic 3D flowers. Sometimes lace creeps up over the illusion, giving you a barely-there sort of style. Wear pretty drop earrings to accentuate the feminine beauty of your outfit. Again, it’s better to skip a necklace. Even though the top is sheer, your skin is a focal point. Keep things organic and natural. Common mistake: Bejeweling your neck or shoulders. Trendy tip: Add a subtle but sparkling headpiece to give your whole outfit goddess-like allure. The v-neckline is fairly self-explanatory. Most gowns with a v-neck feature broad straps or sleeves. V-necks sometimes feature lace or beading; they tend to be figure-flattering and give your silhouette romantic appeal. Match a v-shaped drop or multi-strand necklace that mimics the shape of your neckline. It shouldn’t drop into your bust or hang down over the dress unless you’re going bohemian. An ultra-long necklace is best for a fun, vintage-inspired reception look. Common mistake: Pairing a round or overly formal necklace. It just looks a little weird. Trendy tip: Wear pretty drop earrings that will draw attention up to your face. Ok, so we’re cheating a little on this one. A strapless gown can be a sweetheart or straight neckline. But there’s a special way you can style this. Instead of choosing a necklace, you can pull out shoulder jewelry! Super trendy and extra sparkly, this eye-catching accessory is really its own thing. Add earrings, but don’t bother with much else if you’re going this route. 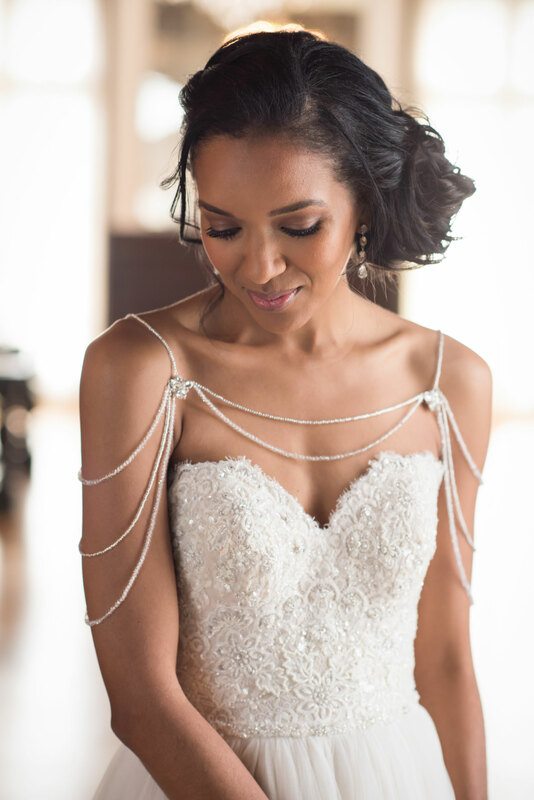 Shoulder jewelry transforms the gown and gives it a very fun and modern look. Common mistake: Wearing earrings and a belt and a headpiece with shoulder bling. It’s a bit much. Trendy tip: Switch out the shoulder jewelry for a cute necklace or jacket for a whole new reception look. Well, aren’t you bold and beautiful! Backless gowns are modern and obviously show off some skin. Sleek and sensual, these dresses tend to feature long trains. They can be softly sweet with billowing organza or princess-chic with lots of lace. This type of gown is dramatic on its own, so avoid going overboard on the jewelry. A back necklace is the best way to add sparkle. If you’d prefer to go bare, play up your earrings. This look is romantic, all the way. Common mistake: Not wearing a veil. You’ll see the gown perfectly well through the sheer tulle. Trendy tip: Wear a bracelet and a loose hairstyle to accentuate your feminine beauty.